In 2016, to find beauty tech at the Consumer Electronics Show, I had to trek off to an out-of-the-way ballroom, sequestered from the gadgets focused on health, fitness, and sleep. At CES 2019, things had changed quite a bit. Clarisonic made its CES debut with its own booth, and Procter & Gamble devoted a huge section to its beauty brand SK-II. 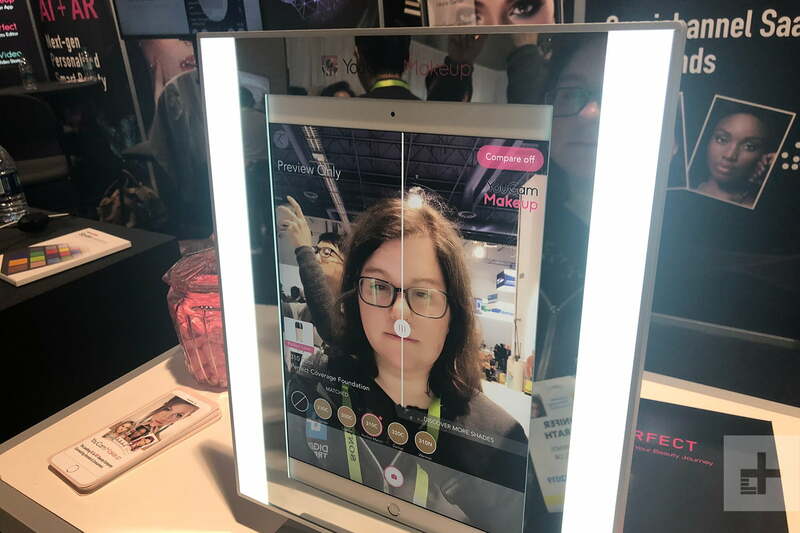 “Three years ago when we were here for the first time at CES, people were asking us, ‘What is Neutrogena doing at CES?’” Sebastien Guillon, the company’s global president of beauty, told Digital Trends. 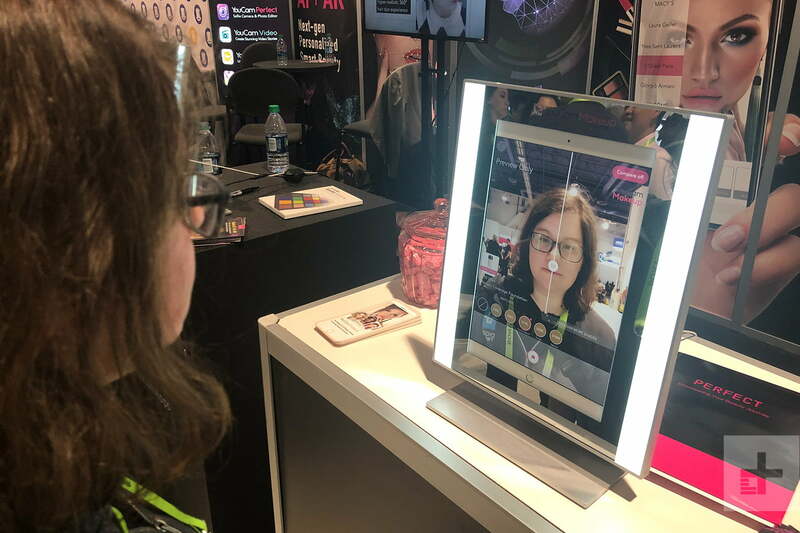 Neutrogena, Olay, and L’Oreal all brought tech to the show, aimed at making skincare and beauty more personal for their customers. Whether you think skincare is a scam or essential self-care, chances are you want to make sure whatever you’re doing is actually working. “Chronic treatments — moisturizer, sunscreens — is a pretty intangible benefit,” said Dr. Paul Matts, research fellow at Procter & Gamble. “We’re promising, ‘In 20 years’ time, you’ll be thanking me.’ That’s a tough sell.” All three brands are looking for ways to give customers more feedback and offer products that are more personalized and easier to ditch if they’re not actually working. That’s where the technology comes in. Olay, a P&G brand, showed me three solutions. The first was its “Future You Simulation.” After taking a high-resolution image of my face, Matts used the app to show me what I’ll look like in 20 years, age spots and all. To make the simulation, Olay took high-resolution images of 1,250 women between the ages of 10 and 80 from five different ethnicities. “It reflects the fact that the human face ages in a fairly predictable way across all ethnicities but there’s also diversity as well,” said Matts. As we get older, there are changes in the bones, muscles, and fat. The app takes this into account, along with the topography and pigmentation of the skin. When I joked (but not really) that I needed to go buy some sunscreen, he replied, “That’s precisely the idea.” It’s a bit Dickensian; this was a shadow of things that may be only, if I continue on my current path. 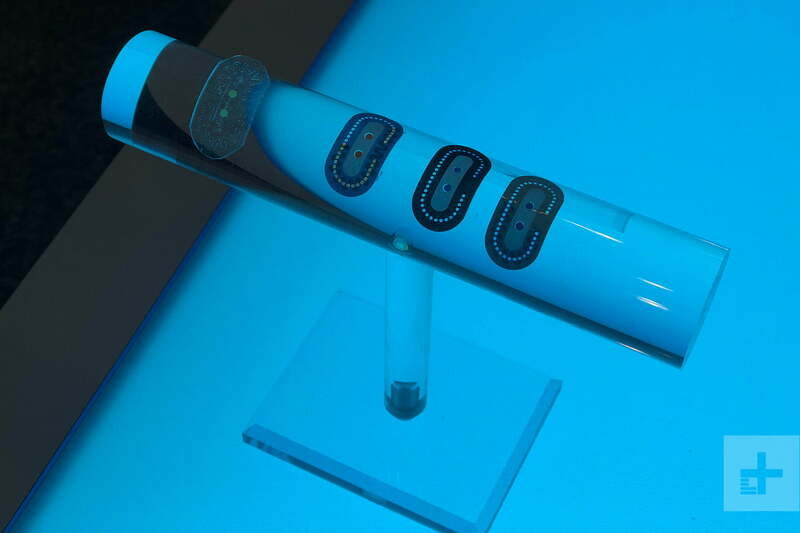 The other two future products from Olay were the FaceNavi Smart Wand and the Olay Moments. In conjunction with the Skin Advisor (which is available now), the wand is supposed to use vibration to more deeply deliver products to specific areas, based on where you need it most. As you look at your face in the app, you move the wand around to different areas of the skin. I could feel a change in vibration on my chin versus my cheeks, but it was hard to tell if anything was happening on a skin level. Users are supposed to take a selfie before and after the treatment with the Skin Advisor to measure the difference. With Olay Moments, a voice-enabled smart beauty assistant, the Skin Advisor also has a role. 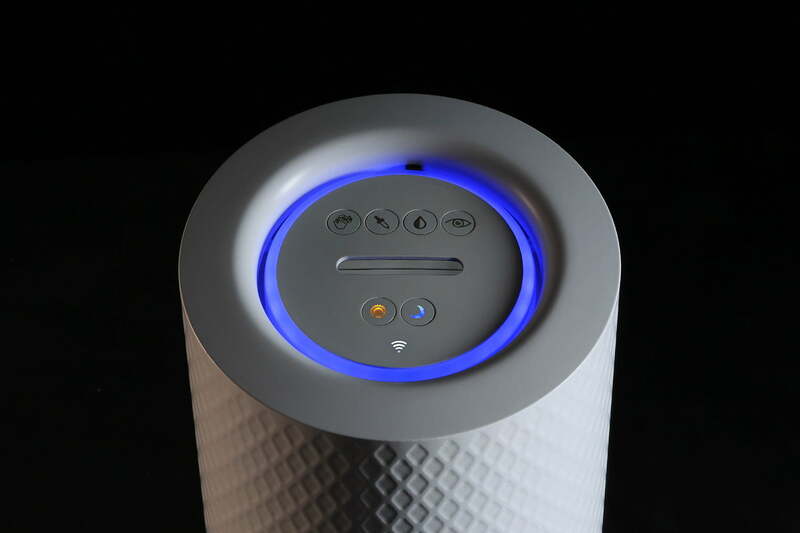 The assistant is a bit like a chunky, glowing, mystical Pringles can. Kristin Waldo, the co-founder of Olay Labs, called it a Keurig for skincare, if Keurigs also added things like hazelnut creamer and just the right amount of sweetener. Pop in a capsule of ingredients, stick your hand under the dispenser, and the machine will deliver the right amount of face wash. Put your hand under again, and you’ll receive a mix of moisturizers for your skin. Or a serum or sunscreen. The assistant will know your regimen, whether it’s night or day, and perhaps even that it’s extra dry, so you might need a moisture boost. The ingredients stay sealed, so Olay hopes to develop formulas that require fewer stabilizers and preservatives. 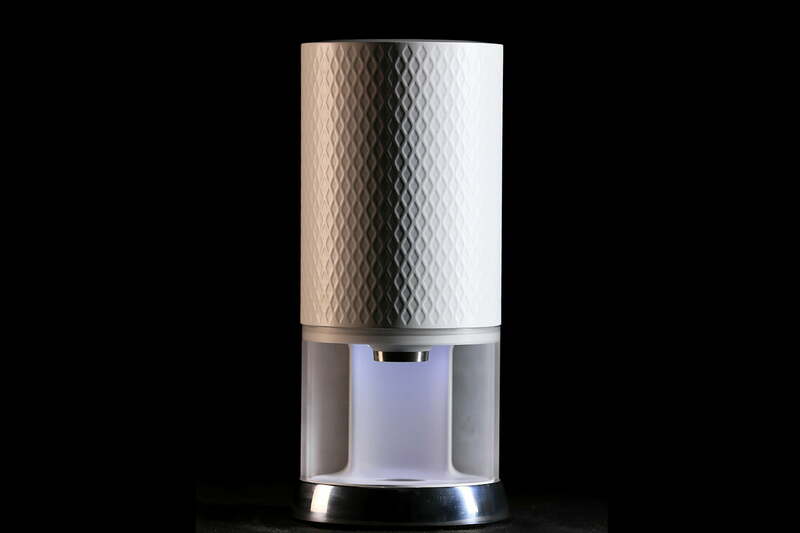 The capsule system also means the advisor stays fairly clean, so you don’t have to clean it as regularly as your coffee maker. Again, it’s meant to get input from the Skin Advisor so it’s making cosmetics based on what your skin needs. It’s also meant to be dynamic, changing up formulas and dosing depending on what’s happening with your skin that day. If you’re trying out a new ingredient, like retinol, the Olay Moments can start you with a lower dose then increase it as you become acclimated. “Your elasticity changes, your moisture levels change with your environment, with your hormones, with your life change,” said Waldo. “By giving you a moment-to-moment reaction to those dynamic elements, what we can really do is max out the efficacy and your experience on an ongoing basis.” Because it’s still in development, Olay doesn’t have pricing information for the device or its capsules. However, it currently has a monthly five-step regimen, Olay Labs, selling for $90, so it will likely be on the pricey side. 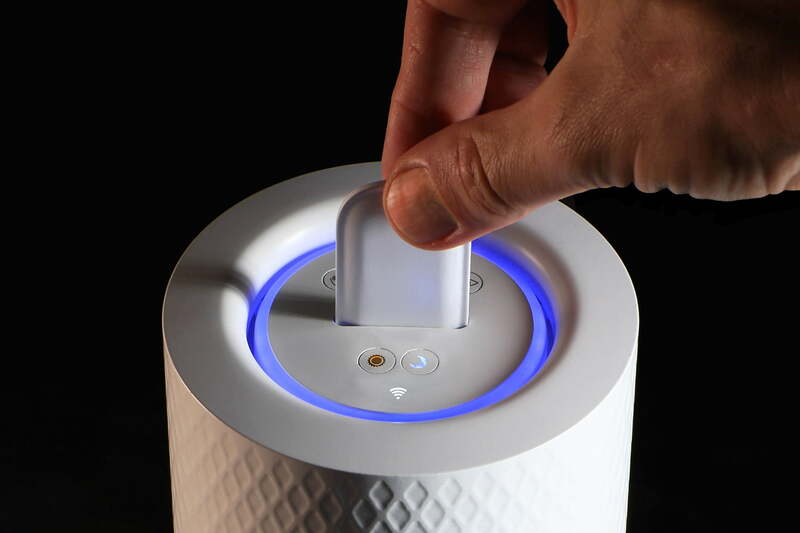 Last year at CES, Digital Trends gave L’Oreal a Best of CES award for its UV sensor that tracks sun exposure. 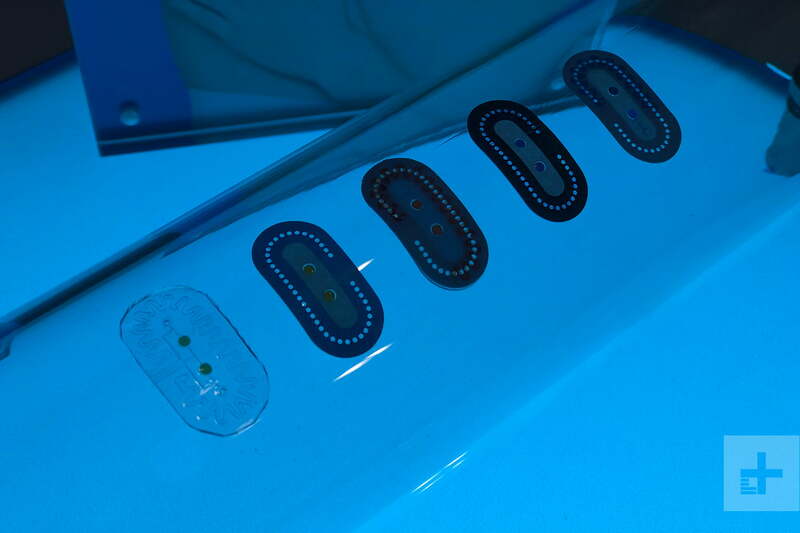 To give people a bit more insight into what’s going on with their skin, L’Oreal debuted its prototype for a pH sensor, the My Skin Track pH. In middle school, you probably dipped litmus paper in liquids to determine if they were acids or bases. “On the human body, that’s difficult to do,” said Guive Balooch, global vice president of the L’Oréal Technology Incubator. Working with Epicore Biosystems, L’Oreal developed this sensor which uses microfluidics — manipulating extremely small amounts of liquids — to direct tiny quantities of sweat through chambers to the pH sensor in the silicone patch. After about 15 minutes, you use L’Oreal’s app to determine your skin’s pH, based on the color that shows up on the patch. You can then recycle the patch. The idea is to track the changes in your pH level over time, weekly or monthly. Healthy skin pH is between 4.5 and 5.5 — a slightly acidic environment is beneficial for antimicrobial properties, according to some studies. Higher skin pH is associated with atopic dermatitis (eczema), acne, and dry skin. “We’re not trying to diagnose; we’re trying to see changes in your body,” said Dr. Roozbeh Ghaffari, CEO of Epicore Biosystems. Alkaline soap can temporarily raise your skin’s pH, so knowing which types to avoid could be beneficial. That raises the issue of education. Most skin products don’t clearly display information about their pH, so L’Oreal will likely make accompanying lotions that do. Eventually, Balooch would like to see the technology take on a predictive role. “It’s more about the condition of my skin today, but we hope that in the future we could use this type of dynamic measurement to be able to understand more and more around where people fall in the level of risk around some of these barrier-function conditions,” he said. The result is a kind of luchadore-esque mask that won’t flop excess fabric onto your chin and into your nostrils. If you’re not sure what type of product to use, you can use Neutrogena’s Skin360 Scanner. It fits over your phone and uses a capacitive sensor to detect moisture; the signal it sends will be sluggish over dry terrain but zip across moisturized skin. 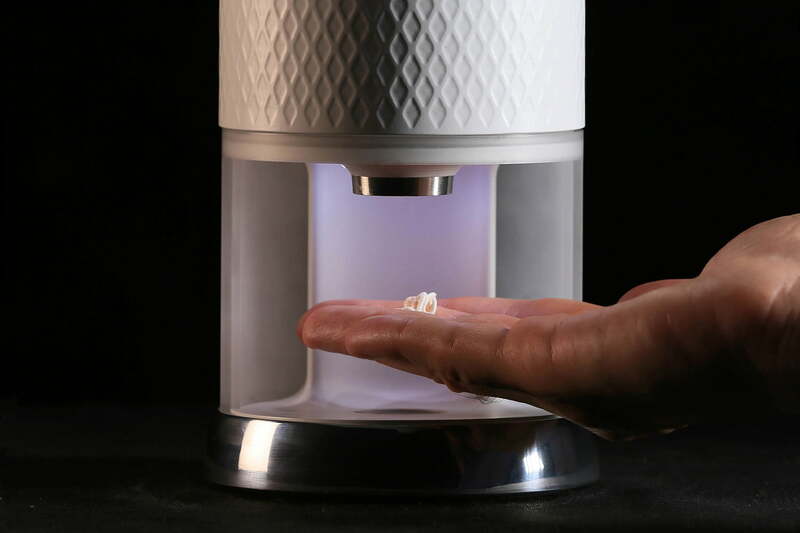 It also uses LED lights and 30x magnification to take images of your skin. The app’s algorithms quantify your pores and wrinkles, including their size and depth. 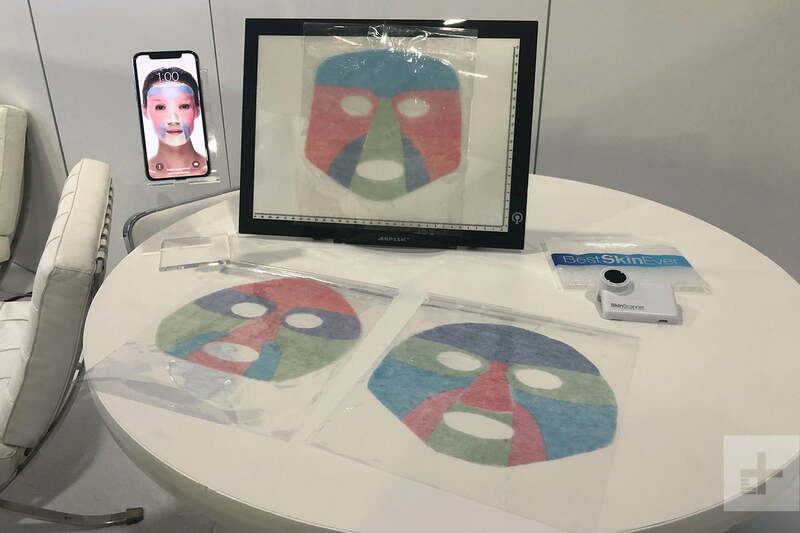 While Neutrogena is still figuring out the supply chain and logistics of printing and shipping the masks, the idea is to get them to customers within a couple of days so it can address issues raised by the scanner. When MaskiD launches later this year, you’ll be able to select from five skin concerns (such as wrinkles, redness, and dullness) for the mask’s six zones. Neutrogena isn’t sure whether customers will be able to buy masks individually, in packs, or through a subscription service, but it wants them to be on par, pricewise, with the brand’s other products. Despite that commitment to affordability, the MaskiD does require an iPhone X to get the personalized fit. Neutrogena is looking for other ways to get accurate measurements from people without the pricey phone. In fact, lots of beauty brands are trying to catch customers’ attention with tech in retail environments. Perfect Corp. makes augmented reality and artificial intelligence apps for companies. Its YouCam app, which is coming to Ulta stores this year, lets customers virtually try on makeup and hair color, flipping from one foundation to another to more easily find the perfect shade. But the app also tries to take some of the guesswork as well, using images of your face to offer suggestions of which makeup best matches your skin tone. “All augmented reality seems to increase sales, but bad augmented reality results in returns,” said Adam Gam, VP of marketing for Perfect Corp. In the P&G booth, visitors could line up to be taken through a kind of skin journey, a scaled-down version of SK-II’s Future X Smart Store in Tokyo. High-resolution images of your face reveal your “skin age” and problem areas, then you can find corresponding products via a projection screen and add them to your basket. Unlike people taking selfies at home, the store can control the lighting for a more consistent experience. As you move from station to station, you activate each with a special smart bracelet that looks like a faceless fitness wearable. You get to this keep the bracelet, which remembers everything about your previous visits and helps you track how well SK-II’s products are working. In the end, that’s really the goal of all this tech: to get you to purchase more products from the brands serving it up to you. At least now they’re trying to deliver a little more proof of progress along with the promises.